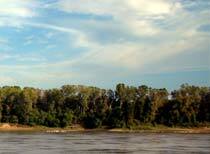 Located on the east shore of the Missouri River – the River made famous by the explorers Lewis & Clark during their Voyage of Discovery – some 27 miles west of the confluence of the Missouri River and the Mississippi River. The 1,891-acre District is situated in St. Louis County, just 5 minutes west of Lambert-St. Louis International Airport and less than a mile west of the busiest major highway intersection in Missouri. It's strategic location is a major reason for the District's development success. The District is a political subdivision of the State of Missouri. 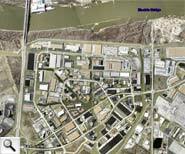 Since 1972, business and economic growth in the St. Louis region has greatly benefited from the development of attractive and very functional industrial, office and retail properties in the District. Location is one of the important keys to the District’s development success. At the end of 2005, the District contained 450 businesses employing 22,800 with an annual payroll exceeding $1 billion. The almost 240 properties in the District have over 18 million square feet of space with a market value of $1.2 billion. The District is protected from flooding by a 500-year levee and supporting flood control system managed around the clock by A.M.C.I. Flood Plain Management assisted by professional engineering firms. The District’s flood control system is considered by many in the field to be one of the finest in the entire country. Supporting this claim is the fact that since 1972, four (4) major floods have tested the District’s flood control system – including the record 1993 flood – with minimal damage that was quickly repaired. Other important details about the District and its operations requires a few more clicks. Once you have read the information you will better understand why the District is proud of its record of success.